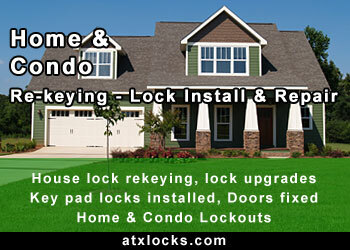 Round Rock door re-keying for you home, business or condo done right quality you can count on. Have you just moved into a new home? if so it's a good idea to have all the locks in the house rekeyed as you do not know how many of your house keys and floating around and you do not want any uninvited guests coming in your home walking off with your property. As a Round Rock locksmith, we offer professional door rekeying and can even match one locks key to another so you can have one key that works all the doors if you want. 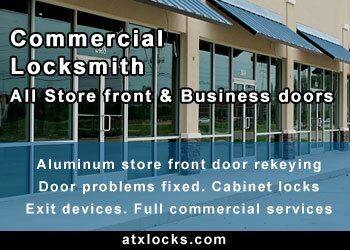 From commercial aluminum store front door unlocking to back door unlocking to commercial door lock re-keying or fixing door problems, we are the right Round Rock locksmith for the job. We are fully bonded and insured and can take service provider calls even after hour calls. Many commercial businesses in the Austin and Round Rock area have the glass aluminum framed store front doors and after changing a employee or manager that has a key to your business it is time to have your doors re-keyed. We provide professional Round Rock area business re-keying at an affordable price for both front and back doors and as many doors as you may have. 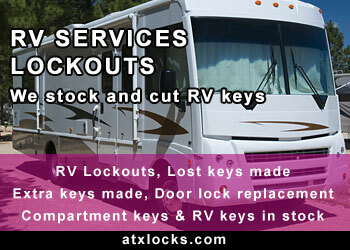 We stock in our Austin mobile locksmith van all the standard commercial door locks and parts so we can re-key, fix or replace any lock as needed. Do you need to master key your building or apartment complex we can do it. As part of our master keying we can also replace older locks with new up to standards locks and deadbolts. No job is to big or to small we can handles any size master key system and work with many different keyways. A Master key system lets you have one or many master keys that will open every door in the master key system but each door will also have its own key that only works for each door so you can give access to managers to many rooms or areas all from one key but not all areas but you can have one key that will work on all doors.